Home »Products »Reverse Osmosis – Nanofiltration »RO : How does it work ? Reverse osmosis is a membrane separation technology. However, it is not a filtering process such as micro, nano or ultrafiltration, but a diffusion selectivity process. A semi-permeable membrane is placed between two compartments containing different salinity solutions. Osmosis is a natural phenomenon that involves the migration of water to the less concentrated solution to the more concentrated solution (osmotic flow). This flow through the membrane will stop naturally when the system reaches equilibrium. It is achieved when the difference in height is equivalent to the osmotic pressure, which corresponds to equal concentrations on both sides of the membrane. When applying a pressure higher than the osmotic pressure to the more concentrated solution, the water flow is directed in opposite direction of the osmotic flow, that is to say in the most concentrated solution to the least concentrated solution : the reverse osmosis phenomenon. The reverse osmosis membrane is a semipermeable membrane. It consists of a layer called “support” of about 50 microns thick, and a layer called the “barrier” of approximately 0.2 microns thick. The polyamide membranes composite thin film (thin film composite, TFC) consist of a porous support layer and a dense layer of the composite film which constitutes the skin of the crosslinked membrane which is designed in situ directly on the porous support, made of polysulfone. The TFC membranes are characterized by high flow rates and high rejection rate. (A) The feed solution is the solution to be treated. It is injected into the membrane by means of a pump. (B) The concentrate is a solution that is rejected and who has not passed through the membrane. It is charged solute (salts, organic matter, viruses, bacteria …). (C) The permeate is the solution that has crossed the membrane, which is purified. 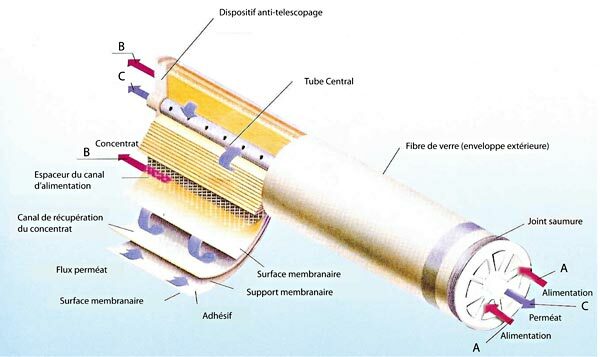 It is collected in the central tube and collected in the membrane release.